A gunman opened fire at a gay nightclub in Orlando, Florida, killing at least 49 people and injuring dozens before being shot dead by police. What do we know about what happened? The attack began at about 02:00 local time (06:00 GMT) on Sunday. Pulse, which is one of the biggest nightclubs in Orlando, was holding a Latin-themed event that was nearing its end when a man opened fire. There were more than 300 people inside at the time. At 02:09, the nightclub posted on its Facebook page: "Everyone get out of pulse and keep running." The gunman, who was carrying an AR-15-type assault rifle and a handgun, exchanged fire near the entrance with a police officer who was working at the nightclub. Additional officers arrived at the scene and a second gun battle ensued inside, forcing the gunman back. He took several people hostage in a bathroom at the back of the building, and told the police he had explosives. At this point, police were able "to save and rescue dozens and dozens of people and get them out of the club," according to Orlando police chief John Mina. With the gunman holed up in the bathroom, police secured the building and began preparing to breach the external wall of the bathroom with explosives. Police chiefs made the decision to storm the building at about 05:00 local time (09:00 GMT), detonating the explosives to create large holes on the building's rear wall. Mr Mina said dozens of people who had taken shelter in another bathroom were able to escape through these holes before the gunman himself emerged. After another gun battle with police, he was shot dead. At least 49 people were killed in the attack, making it the worst mass shooting in recent US history. That figure could rise, with at least 53 wounded people taken to hospital. 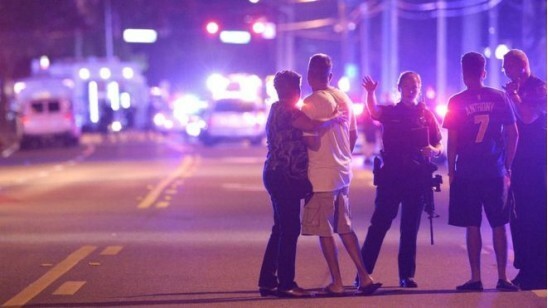 Officials have named the suspect as Omar Mateen, a 29-year-old from Fort Pierce, a city about two hours' drive south of Orlando, in St Lucie County. His father, Seddique Mateen, said his son became "very angry" after seeing two men kissing in Miami recently. FBI Special Agent Ron Hopper told reporters that Mateen had been interviewed by FBI officers twice in 2013 following inflammatory comments to colleagues asserting ties to the so-called Islamic State group (IS). The investigation ended after officers were unable to substantiate the claims. However, Mateen was questioned again in 2014 about a potential connection to Moner Mohammad Abu-Salha, an American known to have carried out a suicide bombing in Syria. Mateen's ex-wife, Sitora Yusufiy, said that he was violent and mentally unstable and had beaten her repeatedly while they were together. It appears that he remarried after that divorce, and had a three-year-old son with his second wife, according to the Miami Herald. Was there an IS link? The group has said it was behind the attack, but the extent of its involvement is not clear. A statement released by its affiliated Amaq news agency said that an IS "fighter" was responsible. An FBI spokesman said Mateen phoned emergency services during the attack and pledged allegiance to IS. The group had called for its supporters to launch attacks on the West during the Muslim holy month of Ramadan, that began last week. But US President Barack Obama said there was no evidence yet of any contact between the gunman and Islamic State. He said it was an example of "homegrown extremism" and it appeared Mateen was inspired by content he saw online. There were more than 300 people inside the club at the time of the shooting. Some have been speaking about what they witnessed. Jon Alamo said he was at the back of one of the club's rooms when a man holding a weapon entered. "I heard 20, 40, 50 shots," he told the AFP news agency. "The music stopped." Rob Rick said the attack happened just as "everybody was drinking their last sip". He dropped to the ground and crawled to a DJ booth when he heard shots. Janiel Gonzalez said it was "complete chaos" as the gunman opened fire. "People were screaming 'Help me, help me, I'm trapped!'" he told AFP. "People were getting trampled. There was no clear exit sign at the club, so we didn't know which door to take or where to go." "All you saw is people running and screaming and there were bodies in the parking lot where bodies were being tagged," Christopher Hansen told CNN. "It was like a scene from a horror movie." US President Barack Obama said this was an act of terror and an act of hate, but authorities were investigating whether there were links to extremist groups. The presumptive Republican presidential nominee, Donald Trump, called on the president to resign for not using the words "Islamic terrorism". His Democratic rival, Hillary Clinton, said: "To the LGBT community: please know that you have millions of allies across our country. I am one of them. "We will keep fighting for your right to live freely, openly and without fear. Hate has absolutely no place in America." She also said there was a need to keep guns out of the hands of terrorists or other violent criminals.